Hello Welcome to In the Moment with the Gates of Consciousness! In the Moment with the Gates of Consciousness! Ever wish you had a quick fix to reduce your irritability and anxiety? With this simple and easy technique, utilizing acupressure, you can. And even better, you can do it to yourself by applying manual, firm pressure to this point, called the Gates of Consciousness, or also known as Gates of the Mind. 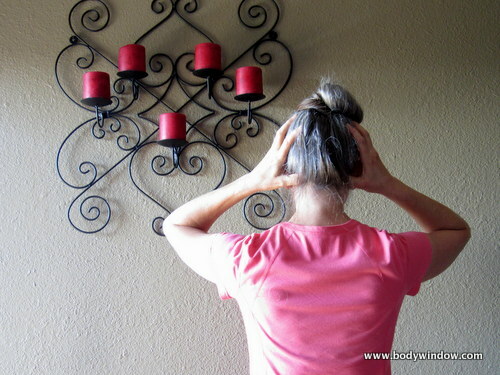 By spending just a few moments with your body, doing self-acupressure on your own Gates of Consciousness, you can find relief from headaches, stiff necks, anxiety, chronic fatigue, irritability and even fibromyalgia. In Chinese medicine, it is believed that our energy moves along energy channels in the body, called meridians. This energy is called Qi (pronounced like "chee.") Often in our busy, stressful lives, this Qi becomes blocked, and our energy no longer flows freely in a healthy and/or healing manner. If we learn to slow down, breath deeply and use body opening techniques such as acupressure, we can restore your energy flow. Acupressure utilizes the same principles as acupuncture, only firm pressure with the fingers is used instead of needles to free your energy flow. To find your Gates of Consciousness acupressure point, or GB20 as it is known, feel for the prominent bone at the base of your skull. This is know as the occipital bone. When you find that area, feel for the soft spot just below it. If you cradle your own head in your hands, as shown in the picture below, your thumbs can almost naturally hook under these acupressure points. As you cradle your head, apply firm pressure to the Gates of Consciousness points with your thumbs at the base of your skull. Begin to breathe deeply, in and out through your belly. Close your eyes. Hold this pressure for 2-3 minutes, applying this pressure with a firm motion towards the center of your head. You may slowly tip your head back, as the pressure releases your neck. Continue to inhale as your head naturally wants to fall back. Find a comfortable spot, while still cradling your head with your hands. When you are ready to come out, exhale and allow your head to fall forward, chin toward your chest. Open your eyes and bring your head back up to neutral. Feel the instant relief from tension and anxiety! Teach everyone you know this wonderful, simple acupressure self-treatment! Who knows, maybe the world will become a better, more stress-free place! These pressure points provide relief from anxiety and irritability by calming the nervous system and releasing endorphins, your body's natural feel-good hormones. What a wonderful and natural way to heal your body, your mind and your soul! May you always breathe through your core when you stay present to your body, when you open your Gates of Consciousness!